October | 2014 | God Wins...but can I ? In high school, I decorated everything with encouraging quotes. And I mean everything. I’ve always liked words and drawing, so I’d illustrate famous, uplifting quotes and place them everywhere – in book covers, binders, pocket folders, my locker, etc. Kids who sat next to me started commenting on this hobby. As I look back, I’m not totally sure the reason that I went to this extreme. I imagine the words and visuals gave me something inspiring to hang onto as I was going through my teen years. I especially appreciate quotes about the difference a community of faithful friends makes during hardship. If it weren’t for the power of my friends and the power of community, I wouldn’t be standing after losing Leah. It’s the support and love of others that have kept me in the calm center of a swirling storm. A wide variety of people have reached out to me in beautiful ways. Two of the most beautiful ways to support me are either to talk about Leah with me or honor her memory in some way. I’ve had people say to me that they are not sure they should mention Leah. They are concerned that it will make me sad or reawaken a memory. The hard reality is that in losing my child, I NEVER forget. By approaching the subject, people are not reminding me of anything that I don’t think about each and every day. Many times each day. Whether I go to work, go out shopping, watch a movie, read, etc. Whatever I am doing, my loss is part of my daily life. Because of this fact, it touches me in a special way when the people around me acknowledge Leah’s life. One dear friend gave me this priceless gift. 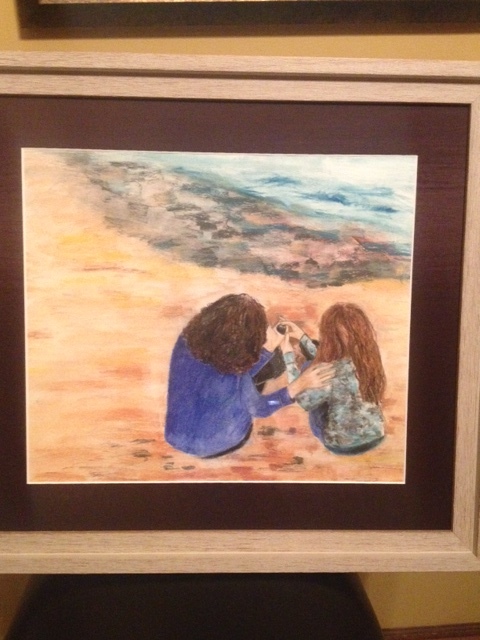 Leah and I loved walking on beaches and searching out colorful and shapely rocks. When Leah was in hospice, my friend asked what she could do for me. She’s a beautiful artist, so I asked her to draw me this scene. The result went way beyond my expectations. Isn’t it wonderful? Another friend keeps Leah in her thoughts regularly, misses her and grieves the loss of Leah’s presence. 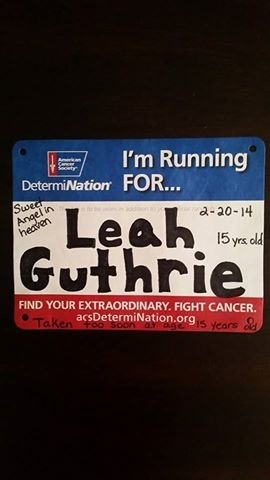 She ran the Chicago marathon recently in Leah’s honor. Another priceless gift. 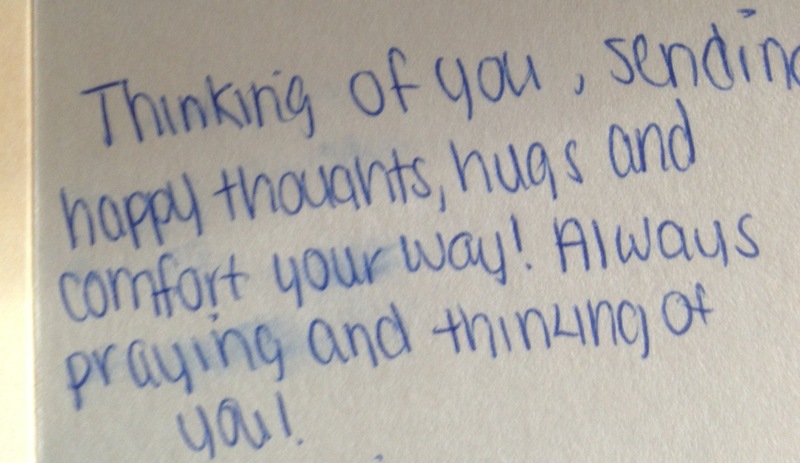 When Leah was ill and passed away, we received dozens and dozens of cards and notes. I keep them in a special box. Just knowing the encouraging words are there is comforting. 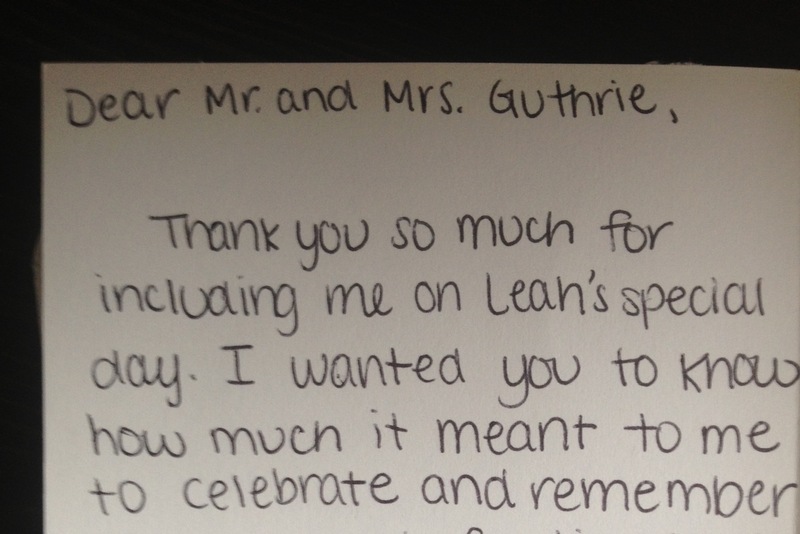 Although 8 months have passed, receiving notes from Leah’s friends or others in the community are still extremely meaningful. Acts of kindness and remembrance give me the courage to keep going on. God uses so many of you who read this blog to touch me deeply. Your words and acts of service give me hope that the world isn’t as dark as it may appear. Life without music is a life unimaginable. I cannot even think of what its absence would do to my heart and spirit. Whether music is soothingly calm or dramatically intense, its expression speaks deeply to my soul. Music calls me to the deeper places of contemplation, emotion and even relationship. Melodies and lyrics have a way of bringing truth, joy and healing to my body, mind and spirit. Leah loved music too. We’d catch her singing in the shower, which she’d love me telling you. NOT! But many of us do sing in the shower, right? She played violin for four years and specifically enjoyed playing the theme song to the movie Harry Potter. When she was having chemo treatments and home a lot, she enjoyed tapping out the Taylor Swift song “Mean” on our keyboard. She was quite good at it. When I think of memories Leah and I shared, one of my favorites is watching the nostalgic TV shows Partridge Family and That Girl together. We’d sing the opening words loudly – full voice: “Hello World there’s a song that I’m singing – common get happy” and “Diamonds. Daisies. No place. That Girl. Chestnuts. Rainbows. Spring time….” We’d laugh. It was mandatory to sing along before the show started. This music was light, upbeat and well – happy! Put us in a great mood. On a spiritual note, Leah didn’t overtly talk about her faith a lot, but I knew she stood firm in her Christian beliefs. When she was a little girl at about 3 or 4 years old, she really liked Randy Travis and his tone of voice and spiritual songs. He did a concert at our church Willow Creek and she loved seeing him in person. Well…that crush ended at 5 years old. Sorry Randy. As I walk this journey of grief, I am leaning heavily into music as the tie that binds me to Leah and to God. I play Matthew West CDs frequently. I can play the same songs over and over. Dozens of times. Hearing them and dwelling on the melodies and words take me to a deep, inner place. I am grateful for Matthew West who so accurately and beautifully expressed thoughts and emotions that I feel. We had the CD this song is on before Leah died. Who knew I’d connect to this song so intimately? My mother Joan also loved music. She worked in a Chicago loop record store with my dad in the 1950’s and got to meet some awesome recording artists. She described being at record release parties with Harry Belafonte, Nat King Cole, Dinah Shore, etc. Somehow Clark Gable showed up at one of these parties. When she told me this fact it was kinda like “Well, I was at the same cocktail party and five feet from Clark Gable.” I said, “Did you go talk to him?” “No. I was too embarrassed,” she sighed. Stunned, I said, “What mom? How awesome, you could have touched him.” My mom was in Clark Gable’s presence. Some memory. As a result of working in a record store, my parents had literally thousands of albums from big band to jazz to country in our home and played them frequently. 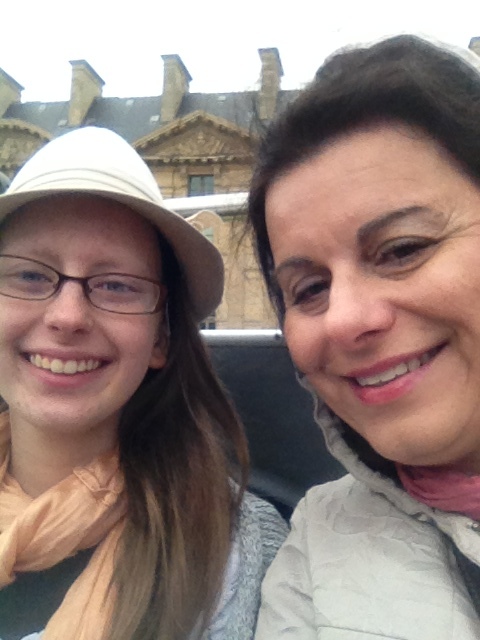 During my mom’s final days, I felt so helpless. Leah just died two weeks beforehand and I had no capacity left. Yet, I wanted to reach out to my mom and somehow soothe her pain. I had the prompting to play some of her favorite songs on my iPhone and hold the phone up to her ear. A priceless memory was seeing her smile as she heard the Three Tenors and Rachmaninoff’s ‘The Rhapsody.’ Listening to the music, she had a serene peace about her. Confirmation once again that music is a gift unlike many others. I will keep leaning into music as the tie that binds me to the people who I love. How does music touch you? I’d love to hear.